1. When did the Society change the church's name from St. Bartholomew's to Pratt Hall? 2. Who was Sarah Burnham and why was she famous this quarter in 1920 in Vermont? 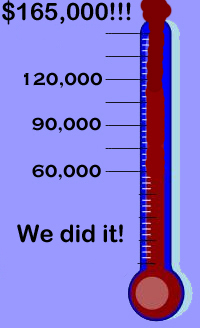 Our progress is shown on the goal thermometer at the top right of this page. Thank you to everyone who has contributed to this very important effort. Fund raising is not for the faint of heart! I will be using this space in the newsletter for the next few issues to update everyone on our West Wall Capital Campaign. We've spent much of the time since the last newsletter getting organized and developing sources. Campaign chairman, Tim Chapin and his committee have divided the effort into several buckets. Bill McGroarty and I are writing grants and contacting government and private institutions. 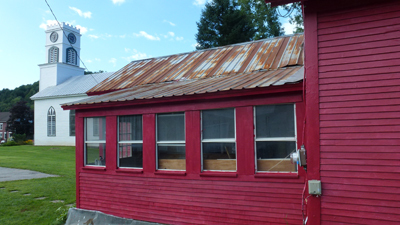 One grant application was turned in to the VT Division for Historic Preservation since the last newsletter and others are in the offing to the VT Community Foundation and Eastman Charitable Trust. We have also coordinated with our federal congressional delegation and will be contacting several community development agencies soon. Marijke Dollois, Sue Wilson, and Patty Perl will be contacting potential business and corporate donors. We hope to cast a wider net to include any business with a connection to the area. 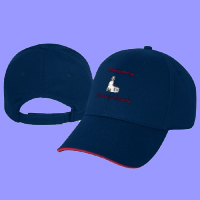 We all are working on fund raising events, products, and individual donor appeals. You should have seen our community-wide mailing. We are hoping to have at least one event or initiative per month through next summer/fall. You can keep up to date on our website. Speaking of our website, we have made it very easy to contribute by credit card or Paypal ( there is more below.) We've also posted a four minute video that shows in graphic terms the reason the stained glass windows are threatened. We've made great progress, as the goal thermometer shows, but need to keep up the pace to be ready to start work next summer. Thanks to all who have donated money, time, and goods and services . 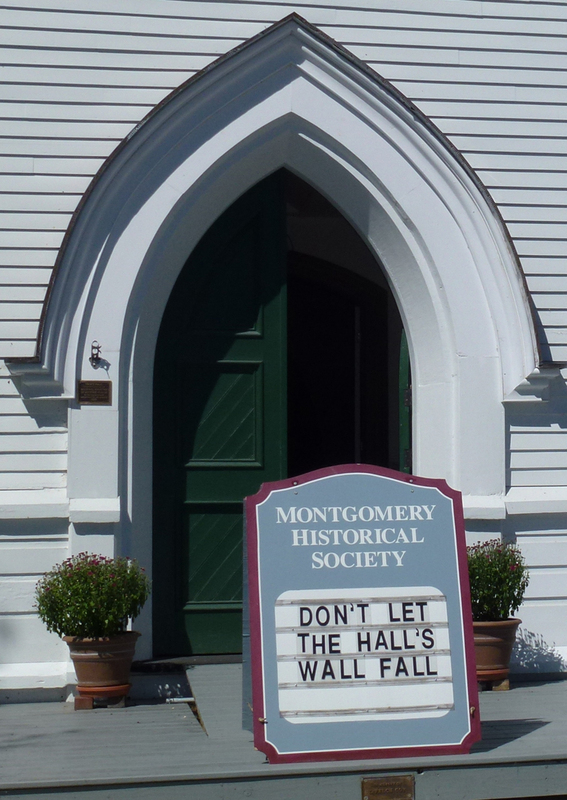 Save the stained glass windows...don't let the hall's wall fall. Marijke Dollois reports we've hit our goal once again with over 200 memberships totaling over $11,000 in donations. This is an astounding accomplishment putting us way ahead of most other Societies in the State. Bragging rights aside, this allows us to keep Pratt Hall in good shape, compete for matching fund grants, and meet our other mission goals. Our thanks to all of you who have joined or renewed. There's always room for more so tell your friends and invite them to join. Over 100 people attended the final concert of our 25th anniversary season; "Lake Street Dive" blew the crowd away. Thanks to Steve Hays for another memorable season. At this point we will probably put the series on hiatus in anticipation of the major work on the hall's west wall next summer but hope to resume as soon as possible thereafter. 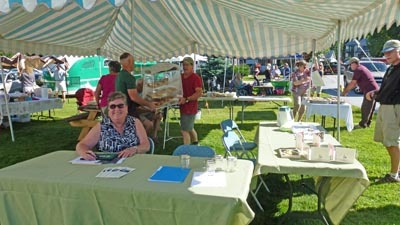 We hosted several of the garden club's vendors (including the lunch grill) next to Pratt Hall during their annual Harvestfest and also opened the building to the public, giving tours and soliciting donations to the West Wall Fund. This was a great opportunity to help spread the word on what we do and why we need to fix the west wall. Sue Wilson at our table. 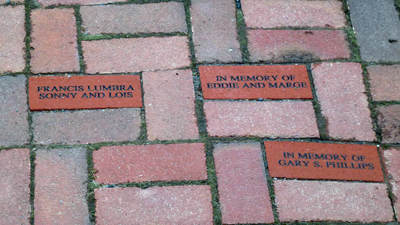 Want to buy an engraved brick? In late August we hosted three ladies from the Franklin County Quilters Guild and gave them a tour of the Hall in hopes of inspiring them as they decided on the design of the quilt they are donating for us to raffle off. 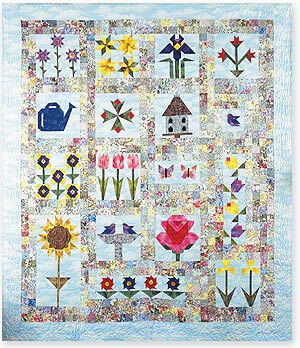 The Guild chose a design called the "Flower Garden" by Julie Golimowski. They said we "will change a few of the blocks to incorporate some of the stained-glass windows (designs) from the Hall and of course, we will add our creative twists which surprise even us." We can hardly wait to see it. We also provided a copy of the quilting patterns done by Lee Cleland, an Australian quilt teacher who visited the hall in 2009 and developed some stitching patterns based on the stained glass windows, organ, light fixtures, and heating vents. They may be able to work some of those quilting patterns into the quilt too. There will be two other prizes in this raffle: a quilted table runner made by Sharon Perry; and a limited edition set of Redwork (embroidery) patterns called the "Bridges of Franklin County" designed by Sharon Perry and Denise Chase. Tickets are $1.00 each with a book of six for $5.00 and are available from Elsie at Lutz's or any other any Board member. You can now donate to the West Wall Fund, buy a Town History or any other item, or make your membership payment using a credit card or your PayPal account on our web site. It's easy and quick. 1. St. Bartholomew's was renamed Pratt Hall, after Larry Pratt, in 1977. We continue to do the routine work needed to keep Pratt Hall in good shape. Tim Murphy fabricated four new clock face moldings (two shown above) for us which we plan to install the next time we have a lift for other repairs to the bell platform of the tower. Each ring contains two layers of 6 arcs each. Sections are put together with offset seams. A HUGE thank you to Tim for donating these four works of art. In other Hall news, after a fairly extended trouble free period, the clock has stopped several times over the past couple of weeks, leading us to go into troubleshooting mode once again. Our two leading theories are weight binding caused by humidity and/or wind interfering with the pendulum swing. We will reprise the wildly popular, and sometimes controversial, "Then and Now" calendar for 2014. The calendar will have at least 12 vintage photos and what the viewpoint looks like today. It will be available for sale around Thanksgiving. We've updated our logo (top left) so it now has the trademark crenelation on top and the building's historic names over the years. Did you notice? The MHS sponsored the VCBS Annual Meeting September 28th. 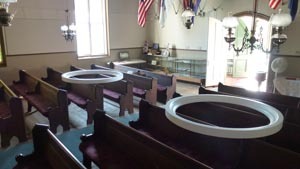 This group of bridge enthusiasts held their meeting in the Town Hall (Grange) since Pratt Hall was booked for a wedding. 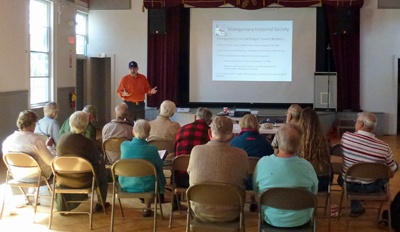 Society Chairman Scott Perry was the guest speaker and spoke about Montgomery's bridges and the golden years after the Civil War when they were built. He also discussed the rather skimpy information we have about the Jewett brothers. After the meeting we provided tours of Pratt Hall and the group used the Society pamphlet and map to visit the bridges. 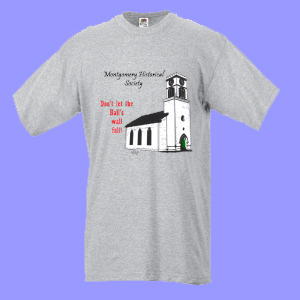 August 1973 was the first recorded meeting of a group that would eventually become the Montgomery Historical Society. They would circulate a petition soliciting people interested in joining a Society. Just three weeks later 34 had signed up and pledged to pay membership dues of $5.00 annually. The following were appointed as a Nominating Committee: Lawrence Pratt, Margaret St. Onge, Sharon DeVries, Beatrice Chaffee, and Irene Scott . In September officers were elected: Directors - Doug DeVries, Sydney Sundell, and Irene Scott; Officers - President Dan Woodward, Vice President Larry Pratt, Secretary Anna Pudvah, and Treasurer Sandra Lumbra. In October By Laws were drafted and approved and in November the group sent their first fund raising letter to finance their plans for a new roof and to remove the top two sections of the steeple tower. At the time the church had a sign out front that read "Unsafe For Visitors." Andy Crane was singled out by the group for his tremendous effort to organize the Society and for his work with the Episcopal diocese of VT to start the process to acquire the church. The Society would take ownership in 1974. In July MHS members attended a two day PTV retreat to network with others, and to develop ideas and potential grant sources for our west wall project. We also sponsored representatives of the new group that is trying to save the former Montgomery Baptist Church who discussed the challenges they face. 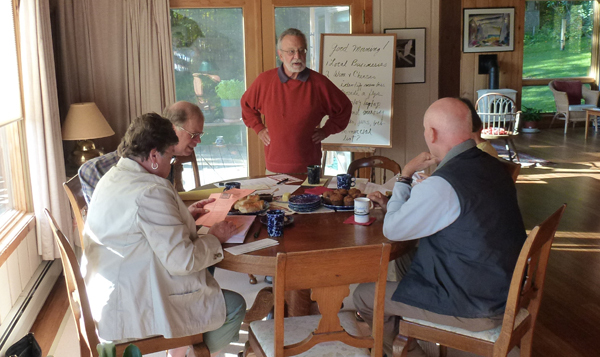 In September we were invited back to another retreat devoted to saving sacred places, to make a presentation on what we have done over the years and to give a status report on our latest efforts. The PTV thought our successes over the last 40 years might be helpful and they asked us to discuss our website and show our latest video on the west wall. 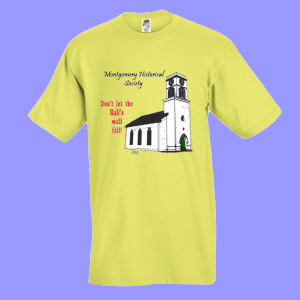 We were well received and even sold a "Don't let the Hall's wall fall" T-Shirt! 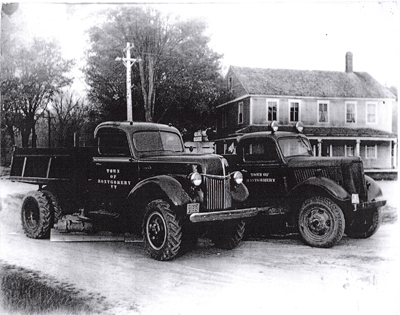 The Third Edition of the Town History is now in final pre-press and we are finishing the index update. Still no word on when it will be available. Recent Donation from Billy Baker Sr.